Broccoli Swamp is a tasty way to eat your greens. 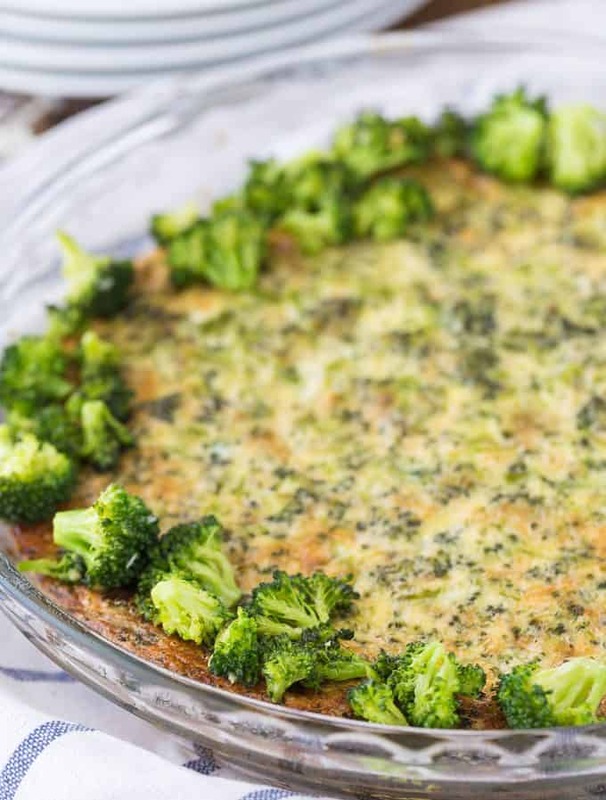 This broccoli dish is a cheesy, buttery, quiche-like dish. Low carb, savory, and delicious down to the last crumbs in the pan. 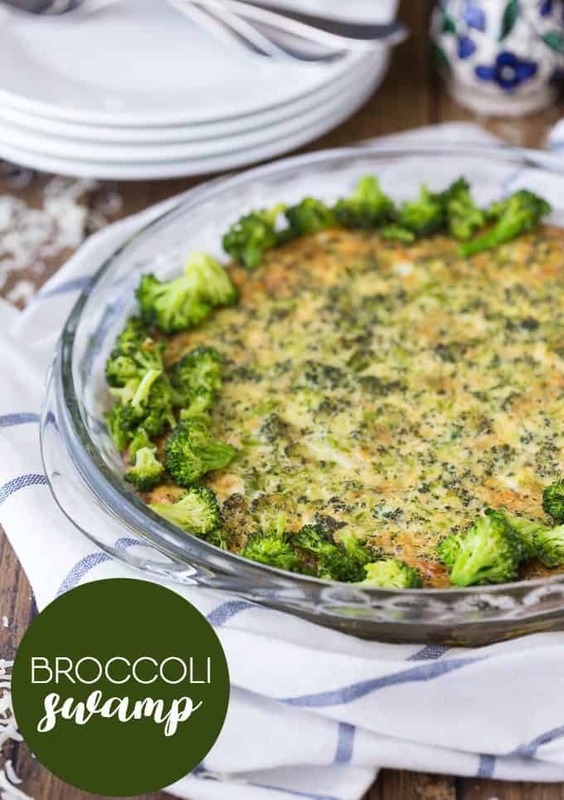 If you are a fan of broccoli, you will do backflips for this Broccoli Swamp recipe. Bridget is obsessed with broccoli. I knew when I saw the recipe for Broccoli Swamp in the Clare Crespo Cookbook titled A Very Veggie World that it was one I had to make. At first I thought it would be like a dip, but in reality, it’s more like a quiche. It was low carb also, so that fits perfectly with my diet. Bridget even gobbled it up! I think what makes this recipe draw in little kids is the name quite honestly! I mean when I think of swamps, I go straight to the Swamp People show on the History Channel! Alligator hunting and all things swampy. 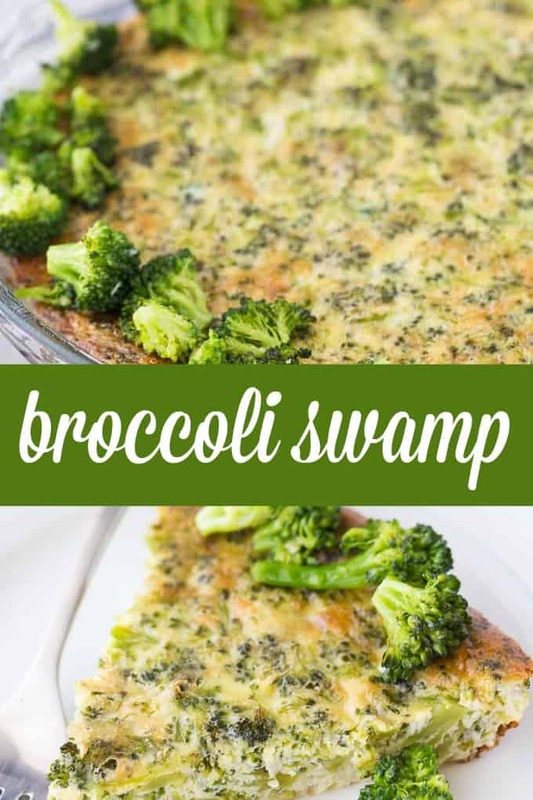 Little kids will love trying something with the name of swamp in it, and adults will enjoy it cause it is a tasty broccoli filled dish. 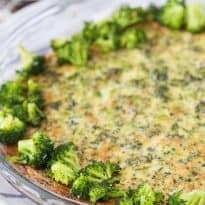 You will find a lot of quiche recipes have a pie crust. This recipe doesn’t use a pie crust, but the filling is similar to what you would find in a quiche. In a way, this is a crustless quiche. 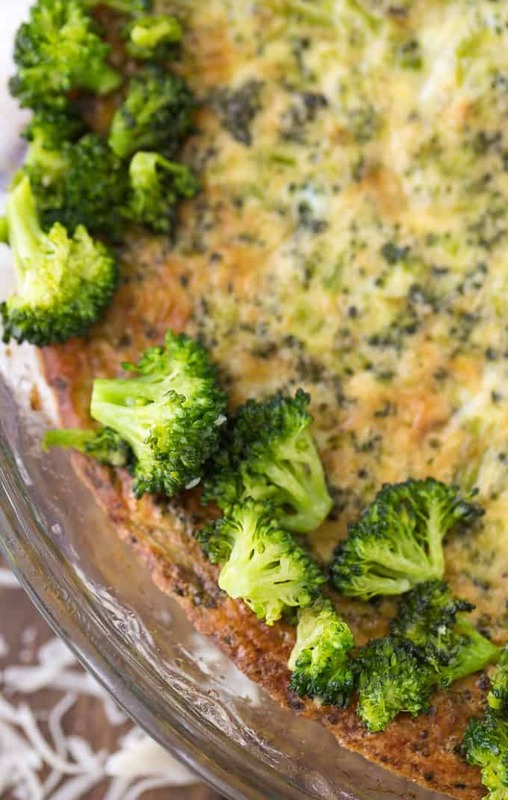 Eggs, chopped broccoli, and cheese baked to perfection. You have a layer of broccoli florets around the edge to mimic the swamp. This dish is baked in a pie pan, so once you pull it out of the oven, slice like a pie and serve! Breakfast, brunch, lunch or even dinner! 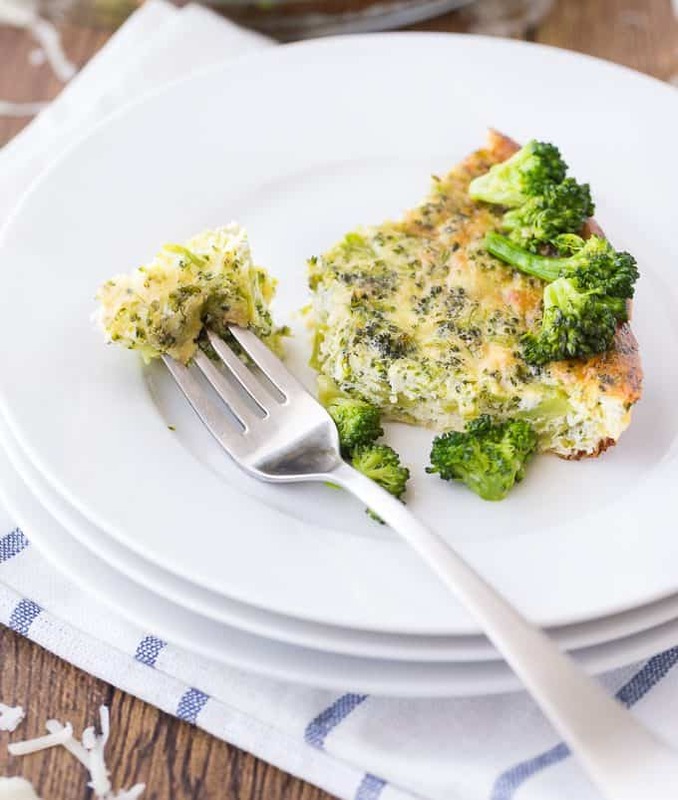 I have to say I don’t think there is genuinely a wrong time to serve up this broccoli bake. I have made this a handful of time, and each time it is a success. Serve for your family or make for a crowd; either way, you will be glad you gave this recipe a try. If you have leftovers, just store in the fridge. Wrap tightly in aluminum foil or cover with a lid. Place in the fridge and store for up to three days. Anything after that you will want to toss out the leftovers at that point. Turn the oven on to 325 degrees, and wrap your swap up in aluminum foil. Warm in the pan until it is warmed through, for a fresh taste. Or if you want the faster route, go for the microwave. Heat in microwave for thirty-second intervals until it is warmed through. I would assume you could thaw out frozen broccoli for this recipe and it would be fine. I used fresh when I made it, but I don’t see why frozen wouldn’t work. I would just thaw your broccoli in cold water and then skip the heating on the stove since it will be softened since it was previously frozen. While we loved this recipe all by itself, you could also add in some fresh spinach or even bacon for a salty and savory aspect. You could also toss in some diced mushrooms or even carrots. Take your pie pan and spray with cooking spray. Then in a pan, you want to melt your butter and then add in your broccoli and cook for two minutes. Then pour you water into the pan and garlic and cook for around five minutes. This will help to brighten and flavor your broccoli. Remove from the heat and drain your broccoli. Dice up 2/3rds of your broccoli, so it is nice and fine. Grab a bowl and then mix eggs, half, and half, cheese, and broccoli. Once combined pour in your seasonings and pour into your pan and bake until it is cooked through. Let stand for five minutes, place extra florets on the edge of pan to create your swamp, and slice and serve! 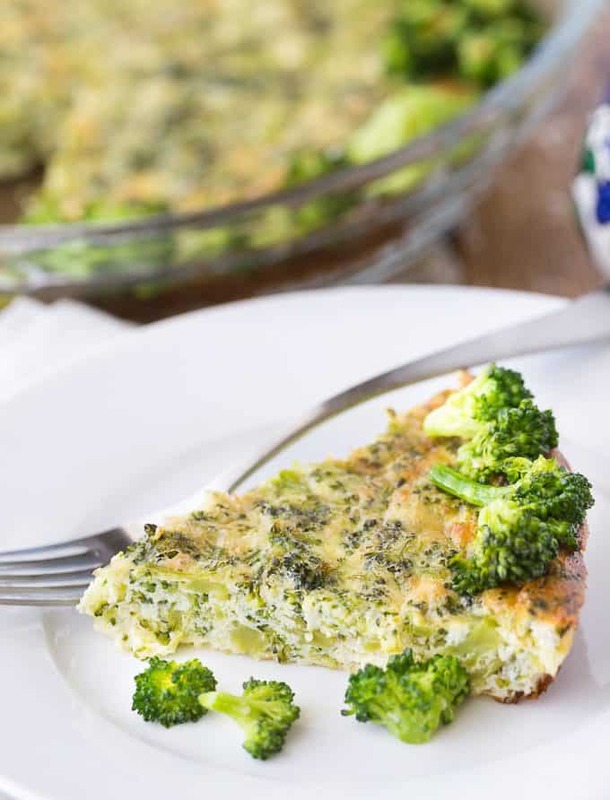 If you are a fan of broccoli, you have to give this recipe a try. We have loved making it, especially my daughter. And what is so lovely is this recipe takes such a short time to assemble and before you know it you have a savory dish to slice up. Have you ever heard of Broccoli Swamp before? Don’t let the name scare you away. This recipe is a keeper! Spray 9-inch pie pan with no-stick cooking spray. On the stove top melt butter in a pan. Add broccoli and cook for 2 minutes, then add water and garlic and cook, covered for 5-7 minutes until broccoli is bright green but ﬁrm. Remove from heat. Set aside 1/3 of the broccoli ﬂorets for garnish and ﬁ nely chop remaining 2/3. In a mixing bowl, beat the eggs and half and half. Stir in cheese and mix well. Stir in the chopped broccoli, salt, nutmeg and pepper. Pour into pie pan and bake for about 35-40 minutes until a knife inserted in center comes out clean. Wow sounds Yummy! Thanks for sharing this great recipe! This looks very yummy and so easy to make. I think I am going to put this in my meal plan this next week. Thanks for sharing. It will not allow me to print out the recipe!!!!! Finally something my little girl will eat lots of. She loves broccoli. Sounds good! Love the presentation! Pinned it. Looks great! I love a new way to fix broccoli. This looks incredible! I would definitely eat this as a main or side dish! Thanks for sharing! Yum! That looks really good. I’ll have to try that! I am such a broccoli fan! This looks SO good. Hope to try it soon. I found THREE in a row TONIGHT ALONE. Many things but the takeaway from this post is that I will make this just to say IT’S CALLED BROCCOLI SWAMP. I can’t wait to try your Broccoli Swamp Recipe and thanks so much for sharing it with us. Hope you will come back to see us at Full Plate Thursday real soon and have a great week! Oh yum! Growing up I never cared for broccoli, but now as an adult I love it. This recipe looks amazing and great that it’s low carb. Thank you for sharing at Merry Monday! I think I am going to make this on Sunday for our family get-together.Thanks have a great weekend !